Pilots flying large aircraft need to be very cautious when making pitch changes near to the ground. A review of flight data shows that pilots sometimes make forward (negative) pitch changes or rapid large aft (positive) pitch changes just prior to touchdown. In both cases, the pilots are probably doing this in an effort to achieve a smoother landing or possibly “save” a landing when the descent rates appear to be too high. Conventional wisdom suggests that because the the CG is ahead of the main gear, the main landing gear will move upwards as the nose moves down when pitching forward; essentially rotating around the CG. This theory does not hold up to analysis. An 8 degree pitch change will only move the main landing gear about 1 foot on the largest aircraft – hardly enough to affect the outcome of the landing. When this fact is illustrated to pilots, many will state “but I have done it and it works for me!” A review of aircraft dynamics reveals the answer to why some say it works, and, more importantly, why it is a very risky technique. At the other side of the spectrum is the scenario where the pilot attempts to “save” a landing at the last moment utilizing a pitch change (upwards) as the primary mechanism. This also can create significant problems in the landing environment. Pushing the controls forward moves the elevator surface downward, increasing the lift at the horizontal stabilizer. This increased lift at the tail, raises the tail and moves the nose down, in the direction of the control input. The opposite is, of course, true as well. Pulling back creates a downward aerodynamic force at the tail, raising the nose. When a pilot pushes forward, the elevator moves down and increases the lift force at the tail. It takes a moment for this force to overcome the aircraft’s inertia, and to actually pitch the aircraft downwards, reducing the angle of attack. The reduced angle of attack causes a change in aircraft lift, and it takes yet another moment for the actual aircraft motion to change as a result of that change of aircraft lift. During this time, the tail lift force is still acting on the aircraft, and is adding to the total lift force the aircraft is producing. As the weight does not change, for a very short time, the aircraft will have more lift than weight, changing the flight path accordingly. The aircraft will initially move up slightly (or reduce its descent rate). With very precise timing it is possible to get a smooth landing this way. Why is it so risky? The pitch transient only lasts long enough for the pitch to actually change. The pitch transient is the initial reaction to the change in effective weight that happens before the angle of attack has actually changed as a result of the pitch control input. The problem is that it is difficult to judge the exact height above the ground in a large aircraft. If a pilot misjudges height even slightly, it can be dangerous. The larger effect of pushing forward on the controls is that the aircraft will lower its pitch attitude, and along with it, the angle of attack of the wing will decrease. The loss of lift will result in the aircraft now moving in the direction of the control input. Once the aircraft pitch actually starts to decrease, the loss of lift on the wings will contribute to an acceleration downward, as the wings are now producing less lift than the aircraft weighs. Landing gear is certified based on the assumption that the wings are producing at least as much lift as the aircraft weighs. The engineers assume you will be flaring, or at the very least, holding the pitch constant. Even a constant pitch attitude results in the angle of attack slightly increasing as the aircraft enters ground effect, softening the landing. Flaring adds a bit more lift, further softening it. The pitch transient effect works the other way too. If a pilot pulls back on the controls, the elevator deflection creates a “down-force” which will pitch the aircraft upwards. However, before the pitch change has occurred, the down-force from the elevator deflection is added to the total weight of the aircraft, and, for a short time, the aircraft will actually accelerate downwards before the increase in pitch results in more lift to start the acceleration upwards. The magnitude of these pitch transients vary with several factors. These include, but are not limited to, the design (plan form) of the aircraft, the amount of wing sweep, the wing loading and how fast you move the flight controls. When flying more than a few feet off the ground, this effect is virtually undetectable from inside the aircraft. Even a hard pull on the controls is unlikely to move the aircraft downward enough to see on the altimeter before the aircraft starts up or vice versa. However, near the ground it’s a different story. For example, an attempt to “save” a landing by pulling back just before touchdown can create more downward acceleration which in a relatively small aircraft could, under some circumstances, be visible due to the height change. If the pilot is relatively close to the center of gravity, they will likely perceive this downward acceleration and react to it. As the perception (correctly) is that the change of pitch did not accomplish the goal of arresting the descent, the likely response would be to add power. The pilot does not need to understand the dynamics involved to make the correct response if they can readily perceive it through outside cues. However, in large aircraft it is more complex. The motion of any aircraft occurs through, and rotates about, the center of gravity. Because the pilots are seated at the far end of the aircraft, as the aircraft rotates around the center of gravity, the pilots can be moving relatively upwards even while the CG is moving down and vice versa. 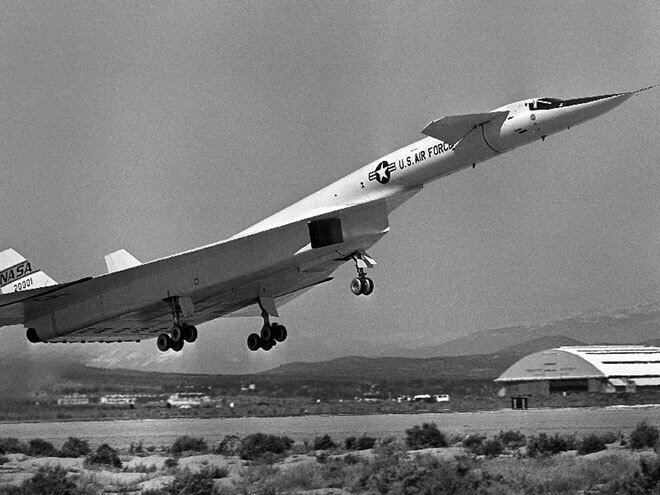 This is true of any aircraft, but the larger the aircraft the more pronounced this effect will be (an extreme example can be seen in the XB-70 pictured above). It can lead to a significant mismatch between what the pilots are perceiving verses what the airplane’s motion is actually doing, particularly when making rapid pitch changes near to the ground. Changes in the flight deck height are very easy to see when looking out the window. If the flight deck is moving up while the aircraft CG (and landing gear) is moving down, and the flight deck is moving down while the CG/gear is moving up, it is not hard to see that a pilot could get in trouble really fast. Consider this scenario: A pilot pulls back hard in a last moment attempt to “save” a landing. This action accelerates the aircraft downwards at the CG. Simultaneously, the aircraft rotates to pitch up, so the pilot’s eye-height levels off, or at least slows in its rate of descent. The pilot perceives that the landing is “saved”, when in reality it is not. The pilot is likely to be very startled when the subsequent landing is very firm, and that can lead to additional inappropriate control inputs. If the pilot continues to use pitch to compensate for their perceptions of what the aircraft is doing, the pilot can get more and more disconnected with what the aircraft is doing, with catastrophic results. Pilots can reduce these risks by establishing a safe landing attitude and then holding that attitude through touchdown. Then they should momentarily maintain the pitch attitude on landing, until positive they are on the ground. They should derotate the aircraft at a rate no greater than the rate used on rotation at takeoff. So what should the pilot do if they encounter a last moment downdraft or some other factor leads to a rapid “sinker” just prior to landing? If pitch is maintained at a constant, then the only other input that can control the vertical path is power. Pilots should be ready to add power as required rather than attempt to make rapid pitch changes near the ground. In severe cases, a go-around is the only viable option. This entry was posted in Safety and tagged aircraft dynamics Airline Safety Investigators Shem Malmquist landing Accident handling qualities Asiana FedEx. Bookmark the permalink.